Chicken Kenny - What the "Forks" for Dinner? Chicken Kenny - What the "Forks" for Dinner? Crush pretzels in a ziploc bag with a mallet or rolling pin. Place on a plate. Prepare mustard sauce according to recipe reserving half for dipping. 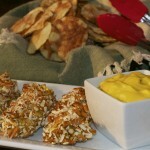 Dredge chicken strips in Kenny mustard and roll in crushed pretzels. Place on a baking sheet lined with parchment paper. Bake for 15-20 minutes or until chicken is cooked through. Serve with reserved Kenny Mustard Dipping Sauce. Kenny MustardBlend all ingredients throughly. Use as a dipping sauce or a sandwich spread.